28.75″ w x 25″ d x 41.5″ h Weight 174 lbs. YES Cart – Will I Break it? 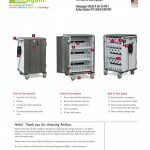 Features patented Power Shuttle® power management technology, the system that efficiently charges up to 40% faster than a standard round robin system. 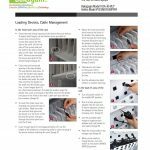 With just one power cord plugged into a standard wall outlet, it safely prevents overloading of electrical circuits by automatically determining the maximum number of devices that can be charged at one time. 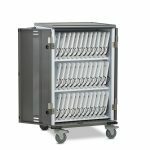 The YES Cart for Mini-Laptops fits ALL shapes and sizes with screens up to 13” and some up to 14” with and without cases. 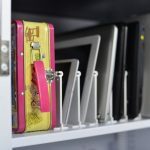 Mix and match devices with tablets, eReaders, and handhelds. It’s completely up to you. 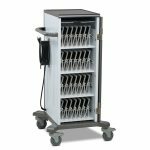 Charges, secures, and transports 1-36 mini laptops like the Chromebook, Ultrabook, and Surface Pro in a strong, adjustable cart. 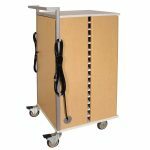 This heavy duty cart is just 28.75” wide x 24.25” deep. It’s also easy to steer, thanks to its wide handle and 4″ locking casters. 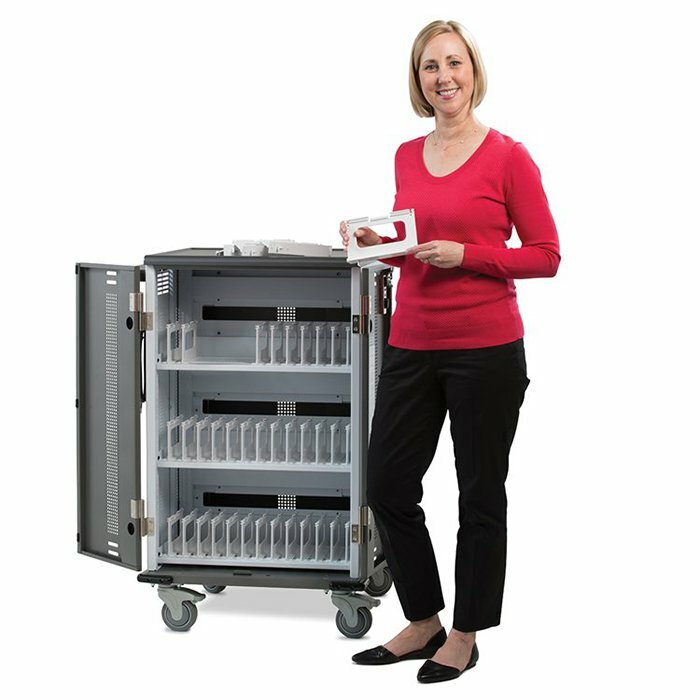 This innovative cart is budget friendly, especially when you factor in its flexibility, you can use it for years and years, even if you switch devices. 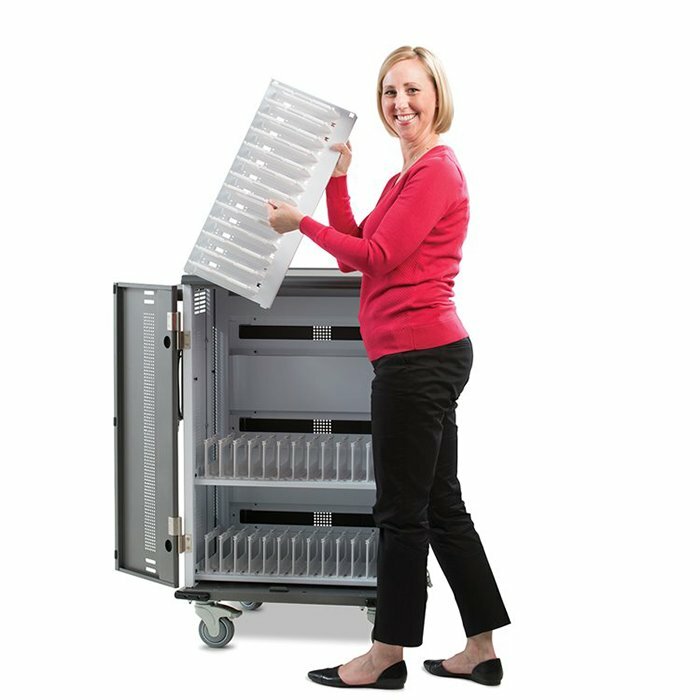 Adjusting the YES Cart’s shelves is simple and intuitive. 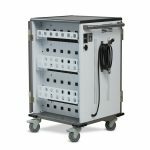 Position them at any height in 2/3″ increments, and store your devices in landscape or portrait orientation, depending on size and the position of the power inlet and on/off button. 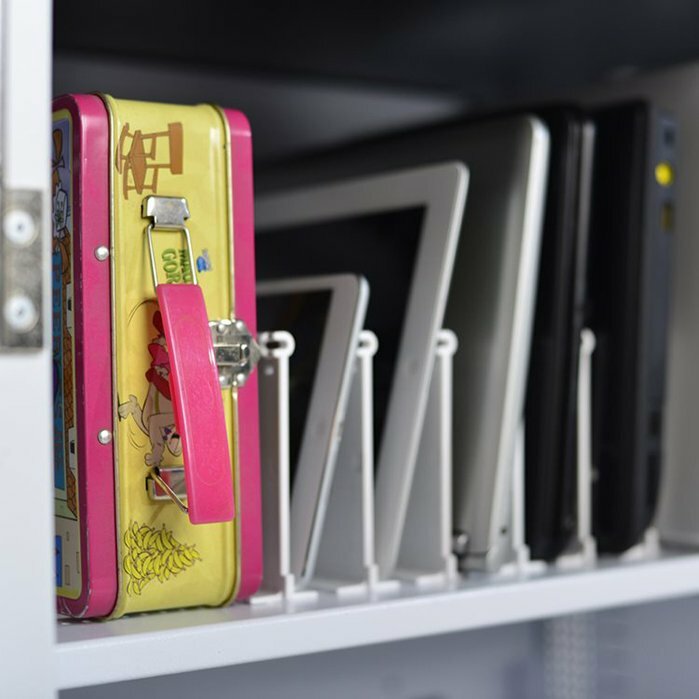 Arrange your mini laptop devices exactly how you want them by adjusting the cart’s bays in 1/3” wide increments. Feel free to really grab and pull on the dividers; they’re sturdy! They won’t break or bend. 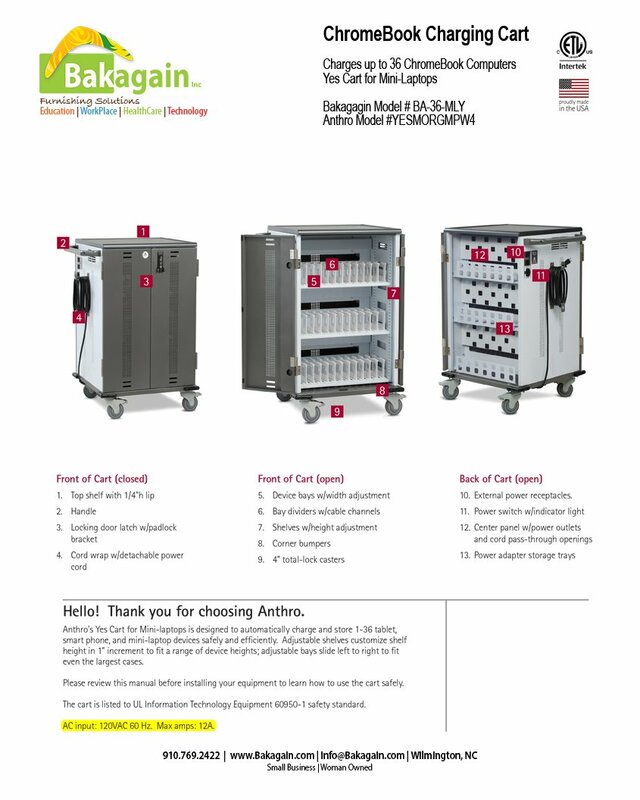 The cart ships configured for 36 units with 1.25″ wide bays. Looking for a Made-in-USA in Oregon. 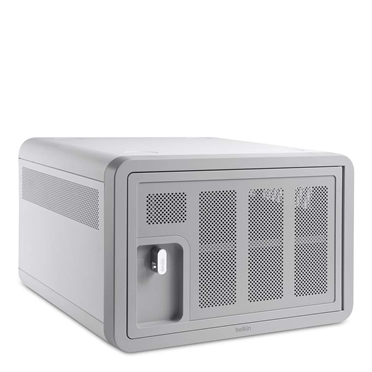 A spacious locking IT area in back keeps cables and power adapters protected and secure. 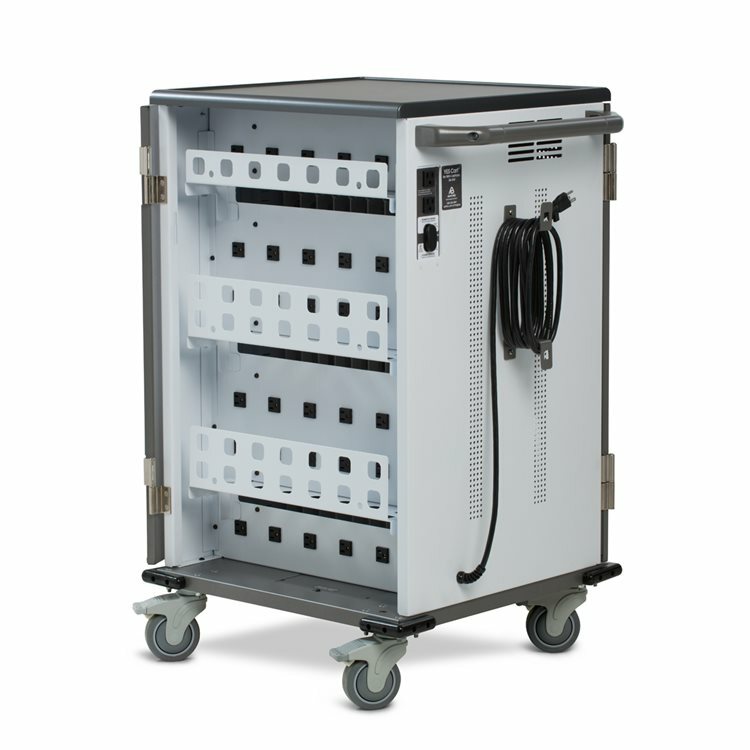 The power outlets face straight back so they’re easy to reach, and three roomy bins store power adapters and cable bundles below the rows of outlets, so they’re tidy and accessible. Interface panel under the handle has two external outlets to power your peripherals plus the on/off button. This innovative cart has heavy duty 4” locking casters so it moves smoothly over rough surfaces, and it’s easy to steer thanks to two directional lock casters and a wide handle with a 13” grip. Adjustable shelves install at any height in 2/3” increments long the 27” high installation track. Store devices on their long side, in landscape orientation, or on their short side, in portrait orientation, as dictated by devices size and the position of the power inlet and on/off button. Cart ships with shelves arranged for landscape storage. Adjustable bay dividers install at any width in 1/3” increments along the 20” long installation track. Supports devices of any thickness, with and without cases. 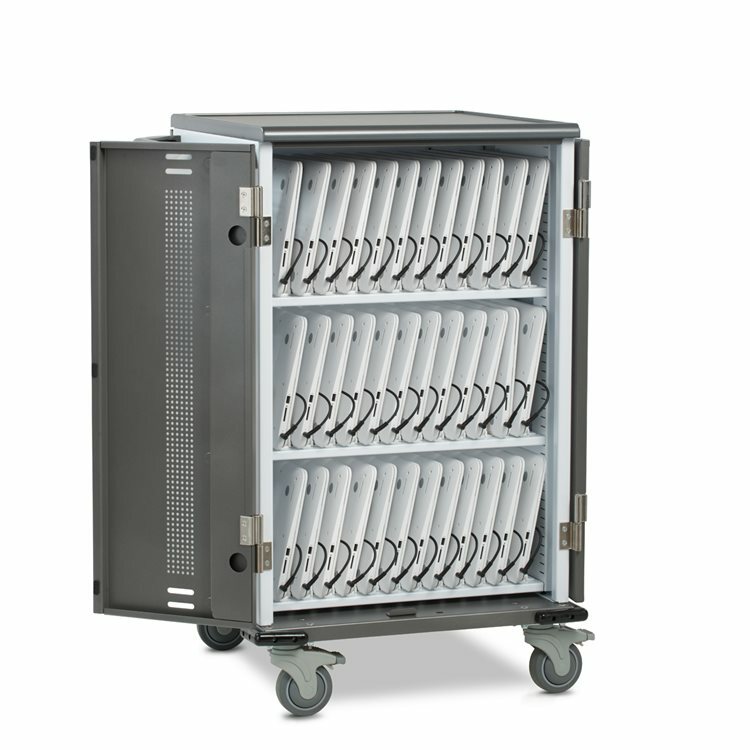 Cart ships configured with bays 1.25” wide x 14.25” deep x 10” high. 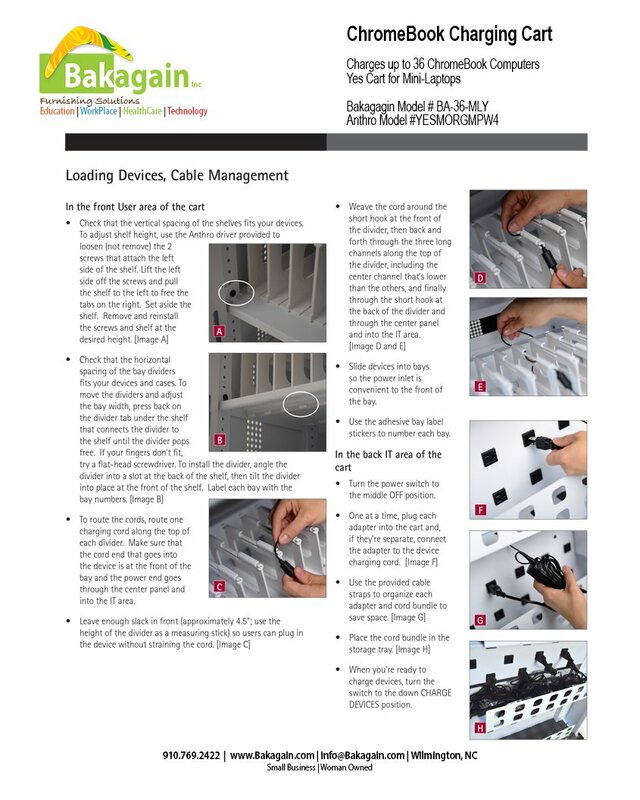 Adjust the bay width and height to suit your devices. 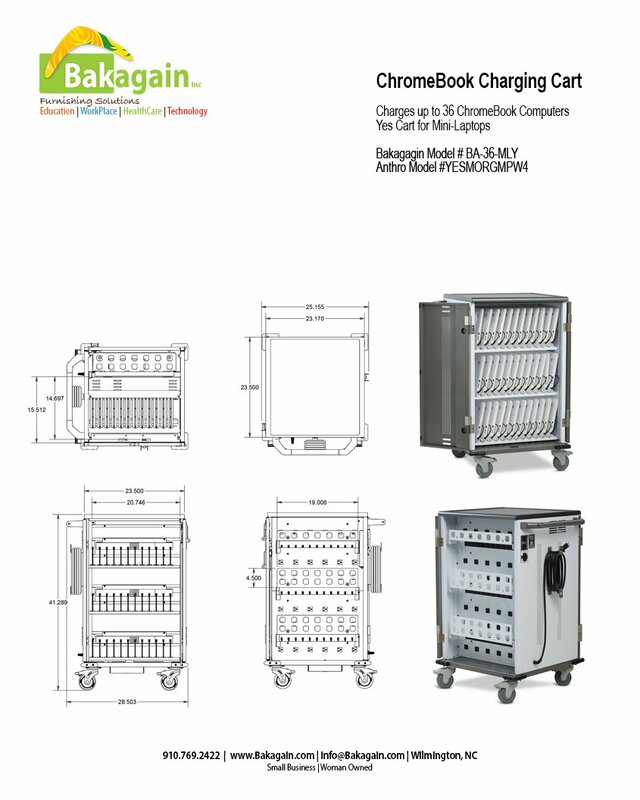 Bay dividers are made of molded ABS polymer and come with cable channels along the top to route charging cords right to the front of the bay. Interface panel under the handle has two external outlets to power your peripherals plus the on/off button. Dual front doors open with a single latch. 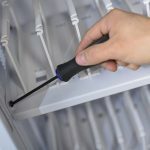 Door panels are reinforced for strength and ventilated to keep air moving inside the enclosure. Four 4” casters, 2 directional lock and 2 total lock, move the cart where it’s needed, even over rough surfaces. 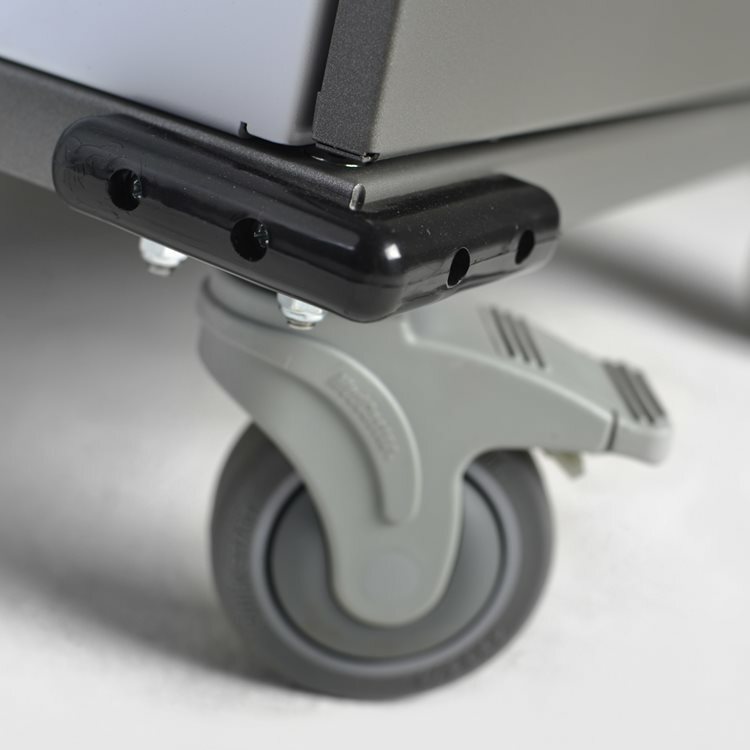 The two directional lock casters make the cart easier to steer. How? Directional lock casters don’t swivel – they lock the direction of the casters so they move in a straight line. Press the tabs of the directional lock casters to lock their direction when you need to move more than a few feet. Release the tabs so the casters swivel when you need to maneuver into tight spaces. Wide handle with 13” grip sits at a comfortable 39” height and makes the cart easy to steer. 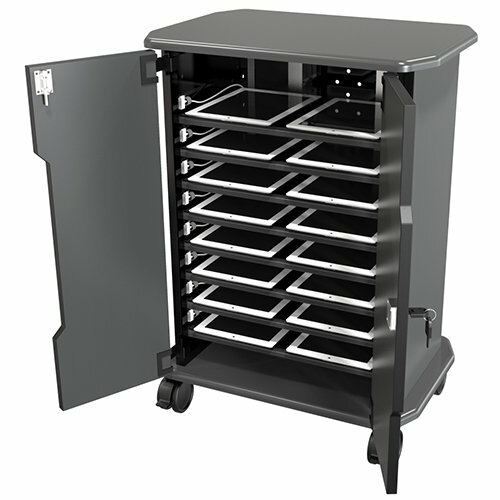 Made with 14 and 16 gauge steel with durable baked on powder coat finish. Empty cart weighs 174 lbs. Shipping weight is 220 lbs. and includes a pallet. 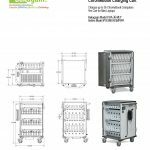 Listed to UL standard 60950-1 and CSA 22.2-60950 and 1678 for both the enclosure and the electrical system, so you know it’s safe. 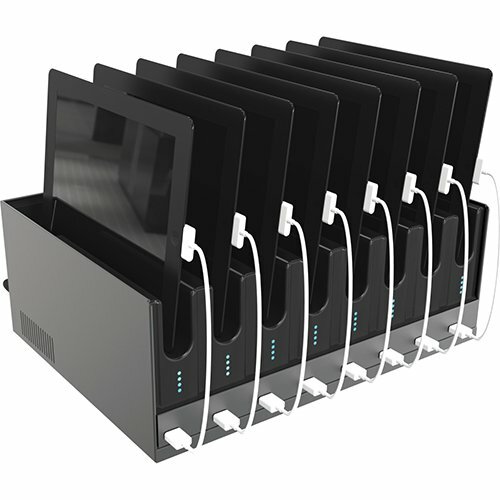 The iTeach Desktop Tablet Charger can easily charge up to eight USB tablet or phone devices right on your desktop. 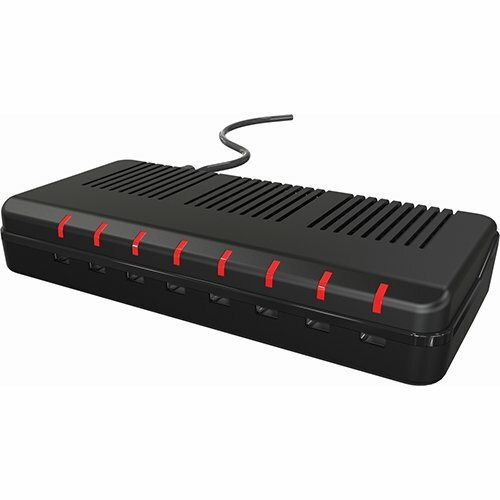 The controlled power management knows which devices need more power, helping to extend battery life and saving energy. Includes four charge indicators and on/off power switch. Charge up to eight devices with one power cord to the wall.